Cool Australia partners with organisations to create high quality educational content and online professional development courses about contemporary issues. We cover a wide range of topics that up-skills educators, so they can critically engage and switch on young Australians to learn for life. 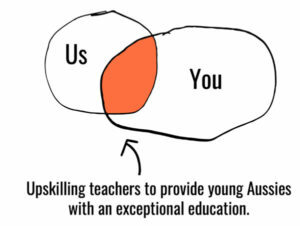 We work with partners who share our passion for providing exceptional education to young Aussies. Like us, our partners want our education system to empower students to address big social, economic and environmental challenges. Cool Australia services include two products: the creation of educational materials and online professional development courses. The educational materials includes units of work and lesson plans that are learning ‘recipes’ for teachers to follow. They include step-by-step instructions, worksheets, Australian Curriculum mapping, and your real-world content. Our online professional development courses are like ‘cooking courses’ for teachers. These courses are on-demand and accredited for teacher professional development hours. Partners provide us with real world content such as documentary films, fun events, research, videos or campaigns. Our team of educational and digital experts use these assets to create high quality materials for early learning, primary and secondary educators. The finished material is hosted on our website for our teacher members to download free of charge. We have an extensive reach into 89% of Australian schools. We want all of our teachers to know about our partnership and the associated materials. So we shout it from the rooftops with an extensive outreach campaign that drives engagement from education sectors across the country. We provide partners with a project report that states the reach and impact of the materials. All profits go back into supporting the mission of Cool Australia to help foster the next generation of change makers to ensure a sustainable future.